Attention is invited to this Ministry's instructions issued under RBE No. 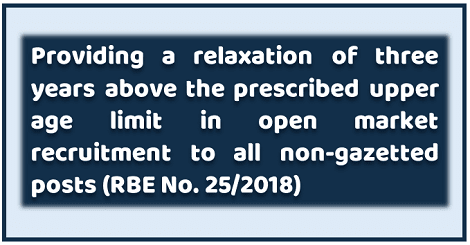 45/2015 dated 11.05.215, withdrawing three years relaxation in the prescribed upper age limit for direct recruitment to all non-gazetted posts. These instructions will be effective from the date of issue of this letter. It will also be applicable on recruitment notification publlished under Centralized Employment Notice Nos. 01/2018 and 02/2018 issued by Railway Recruitment Boards (RRBs).